The Mousetrap was finally sprung last year after 60 years of playing to bemused audiences in the West End. It hasn’t stopped touring since. The 2014 tour has had a change of cast to keep things fresh but Agatha Christie’s definitive country house murder mystery is as entertaining as ever. The grand interior of the Monkswell Manor Guest House is on stage at The Grove Theatre, Dunstable, this week and, even if you’ve seen the play before – as a good many in the audience obviously had – there’s still a rollicking good evening to be had trying to guess whodunnit. Director Ian Watt-Smith has his hands tied about tinkering with the production. The chintz may be fresh but the style and appearance probably haven’t changed since it first opened in the mid 1950s. But he has slipped in a few moments of levity which lift and energise the story for modern audiences. The drama starts with screams and it’s soon revealed that a woman in London has been murdered by “a homicidal maniac” who was wearing a dark coloured coat, a soft felt man’s hat and a light coloured scarf. Enter the prospective guests and our chief suspects are all wearing the aforementioned clothing when they come to stay at the Manor, a newly opened guest house run by Giles and Molly Ralston. The Mousetrap is like an animated version of Cluedo. You spend the whole 90-minute performance being fed red herrings as you try to suss out the identity of the murderer. The new cast has slipped effortlessly into their roles with West End veteran Michael Fenner reprising his turn as the “uninvited guest”, Mr Paravicini. Fenner is so deliciously over the top. He plays Johnny Foreigner, one of those coves that Christie always threw into her stories and it reflected her jingoistic belief that anyone from abroad must be a wrong’un. twinkle in his eye and playful cynicism in his voice. The writer’s other subjects are pure stereotypes – the pretty lesbian, the tweedy battleaxe, an emotionally unstable young man, a seemingly down-to-earth army type and the earnest copper (Jonathan Woolf). The ensemble play their parts beautifully. Anne Kavanagh’s crusty former magistrate, Mrs Boyle, does a wonderful sneer and line in contempt. Ryan Saunders, back this year in the yellow trousers as mentally unbalanced Christopher Wren, leaps enthusiastically about the stage in a great act of attention-seeking. Chris Gilling makes a convincing major while Ellie Jacob is glamorous as the slightly mysterious Miss Casewell. The guest house owners, Giles and Molly, (Hollyoaks star Henry Luxemburg and Joanna Croll) are under-written and underused. As the reluctant hotelier, he spends most of the play rubbing his hand nervously over his face and berating the guests, while she is always scurrying off to the kitchen. Somehow The Mousetrap defies its age. It may be the grande dame of British theatre but there’s life in the old girl yet. It still amazes me that, after 60 years, they still ask the audience not to let on whodunnit. Actually, what amazes me most, is that most of the audience obeys. 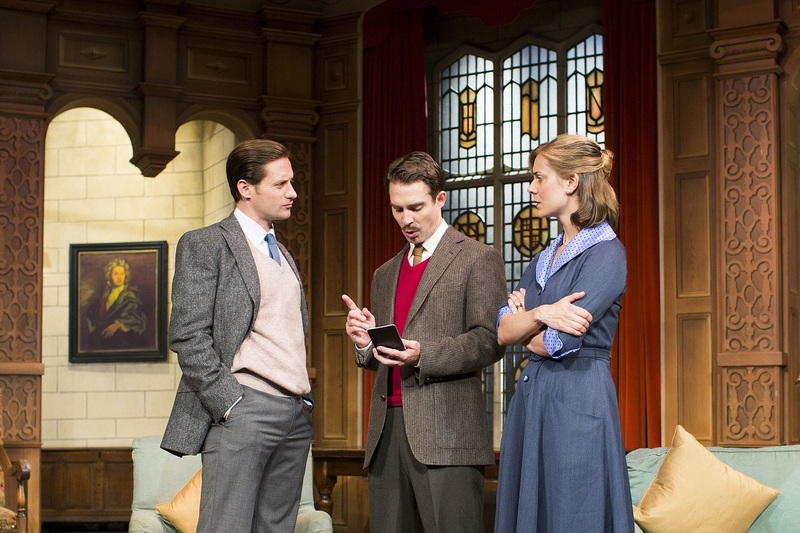 The Mousetrap runs at The Grove until Saturday and is then touring until the end of the year.